"Art is for everyone. That means you. Arts in Motion, a non-profit corporation, presents concerts and education programs that bridge generational and cultural gaps while preserving and expanding the classical music tradition. Through collaborations with video artists, electronic musicians, poets, and interactive designers, AIM's informal and accessible concerts present new forms of multi�sensory art. 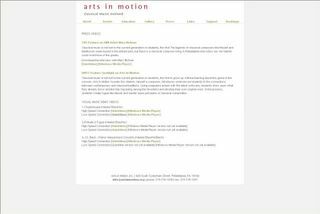 Arts in Motion Education Department (AIMED) brings classical music to underserved youth with free performance demonstrations and computer�aided music composition lessons. Both AIM's concerts and education programs employ the latest technology to bring classical music into the 21st century."